The Survey Department holds some vector maps (also called ‘line maps’) in Ghana Grid reference, i.e. Ghana Grid TM projection, Accra datum, War Office ellipsoid, in feet. Research work is currently undertaken about the conversion parameters (5-parameters or 7-parameters method, all fixed empirically). 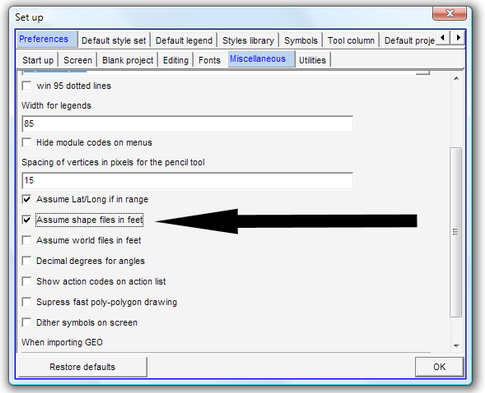 See Annex 8 and also Annex 1.1.7 for the procedure to set up projections at Map Maker). These conversion parameters are necessary to convert existing maps to UTM (WGS 84) – not for new maps and surveys. Find below the process to convert maps from Ghana Grid in feet. (Very similar process to convert from meters is explained in Chapter 5.2.3). 1. If the file is not in SHP format, convert it to SHP format. For example, if it is in E00 format, see Chapter 5.4.2 and Annex 14.2. 5. Quality-check and see, if the converted data fit to other correct data, in particular GPS-tracked data (e.g. roads) or georeferenced photos.